The Bitcoin community has been talking about multi-signature wallets for years. However, it is still very difficult for end users to use these wallets. Multi-signature wallets should allow copayers to communicate, but there is no standard protocol for seamless communication between copayers. The Bitcoin community should standardize the communication process. We’re going to learn to use a 2-of-3 multisignature wallet with Coinkite’s API and Bitcore. One cosigner will use a Coinkite account, and the other will use the Bitcore library in NodeJS. First we need to create a multi-signature wallet on Coinkite. Select “Multisig vault” on the Coinkite wallet page. 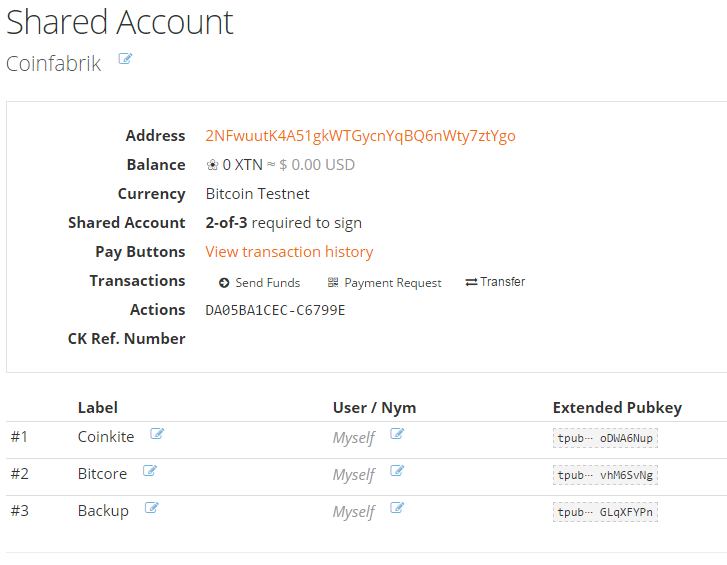 Enter an account name and select “Bitcoin Testnet” as currency. Choose 2-of-3 (the default value). Now it’s time to configure each cosigner. For the first cosigner, select “Simple”. This cosigner will be controlled by Coinkite, so we name it “Coinkite”. For the second cosigner, select “Generate Key”. Go through the process until you see the screen below. Securely store the “HD Wallet” part. Next, click “Upload to Coinkite”. Rename the second cosigner “Bitcore”. Each of the three cosigners in a 2-of-3 wallet has a private key, however, since two cosigners are sufficient, we will use the third cosigner’s key as a backup. Choose “Passphrase” or “Generate key” and name the third cosigner “Backup”. Click “Create Shared Account”, accept the warning, and your multisig wallet should be ready. The above window shows your balance, your receiving address, and the public keys for each cosigner. Save this page to your bookmarks as it might come in handy later. We need Coinkite’s API keys. Go to https://coinkite.com/merchant/api and click “Create New Key”. 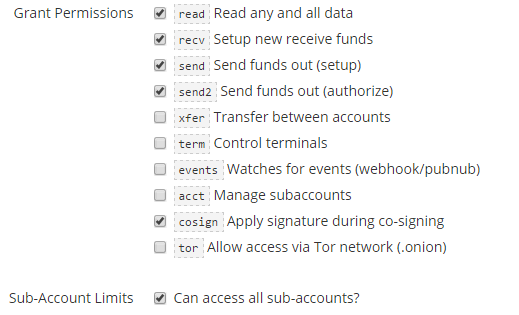 On the next screen, check the following permissions: read, recv, send, send2, and cosign. Click “Save Changes”. You’ll be given an API key and an API secret. Write down the API secret as it’s only shown for a limited time. To make your first API call, create the file “app.js” containing the code below in your project folder. Don’t forget to enter your own API keys. Here we’re using the request package to call https://api.coinkite.com/v1/my/self , which is a Coinkite API endpoint, to get general information about your account (view documentation). We’re using Coinkite’s helper to place the correct authentication headers. When the json option is set to true, the response body is automatically parsed for us. The following helper code will allow us to call any Coinkite endpoint and automatically set the correct header. Create a file in the same project folder called “coinkite-helper.js”. The request function can now be used for any Coinkite endpoint, any HTTP method, and parameters. If you run the app again, you should get the same result as before. The Coinkite API endpoints we will be using are /v1/new/send and /v1/co-sign (link to this cosigning related ones). Make a send request (using /new/send). You will get tha “CK_refnum” to identify the send request. You can use the detail endpoint with any CK_refnum to see all the information about that object, which could be anything (requests, accounts, cosigners…). Get the signing requirements for the cosigner we have named bitcore by using /co-sign/<request_refnum>/<cosigner_refnum>. Ask Coinkite to sign the transaction. Sign for the “bitcore” user and send the signature via /co-sign/<request_refnum>/<cosigner_refnum>/sign. Now we will guide you through the code for each of these three steps. 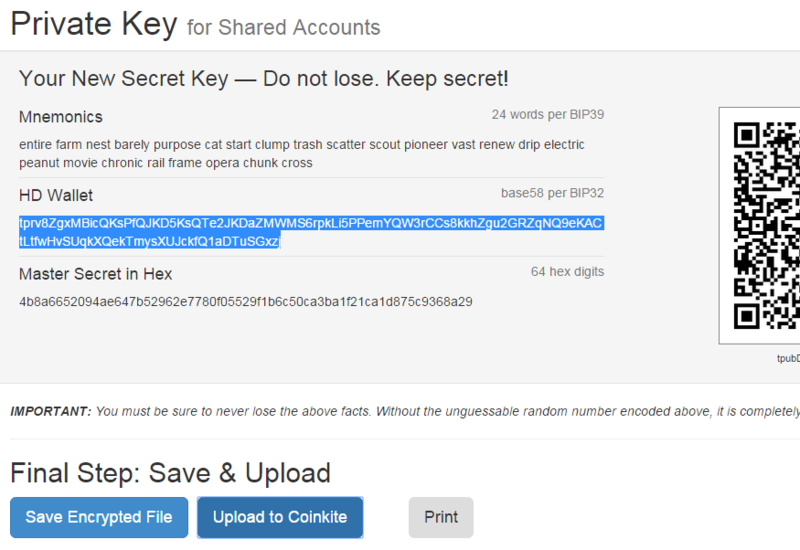 The “bitcore” user’s xpubkey and xprivkey should be the ones we generated earlier. In order to try this, your wallet must contain bitcoins. Here’s a faucet that you can use to obtain free testnet bitcoins. To resume a previous transaction, use the endpoint /v1/list/unauth_sends. Now for the fun part (signing stuff is fun, right?). We will sign the transaction with the Coinkite API and then add another signature with Bitcore. You should get the message “Signature added, but further signatures are required.”, along with data related to the transaction at hand. We will use the “Bitcore” cosigner’s CK_refnum for the other signature. Fetch the signing requirements, sign them, and send the signatures back to Coinkite. First we request the signing requirements for the “Bitcore” cosigner, then we send the corresponding signatures. sighash: This is what we sign. pathIndex: This is the x value in Coinkite’s m/x derivation path. We use the pathIndex to derive a regular private key from an HD key. address: The input address.We can use the input address to ensure that we generated the correct private key. We will also need to generate a private key (privKey) for each input. We use Bitcore, our xprivKey and the derivation path provided by Coinkite to do this. With this private key in hand, we sign the sighash using the bitcore.crypto.ECDSA.sign function. We then assemble a triplet for each input with the corresponding signature, sighash and path index and send it to Coinkite. See our sample code for an example of how to link all of these functions together to perform a transaction from start to finish. Hierarchical Deterministic (HD) wallets generate a new address for each transaction. The only difference in this case is that each of those addresses is multi-signature. A 2-of-3 wallet is associated with three public keys.